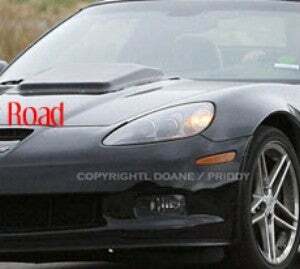 Spy Photos: 2008 Corvette SS, Stingray, Mako Shark, "Blue Devil"
Crap, look at that hood scoop. Some new shots of what looks to be a test mule for the oft-discussed, $100,000 "Blue Devil" Corvette emerged in the 'Vetteosphere. Spy photogs recently bagged this highly scooped specimen, which spy Chris "the ear" Doane says could only be powered by a supercharged 6.2-liter V8. Speculation is that the new super 'Vette, which could be called "SS," "Stingray," "Z07," "Mako Shark," or other construct involving marine life, the letter Z, or a number of Ss run concurrently, will produce 650 hp and use carbon fiber to lighten its curb weight under the Z06's bulk. "Blue Devil" is dead. Long live something else.